Details:Throwback old-school informational style ad (see Ogilvy on Advertising). Was going to be used in New York City, the Bed Bug capital of the world. Duties for this project included marketing research, as well as conceptualizing and designing the ad. Objectives: To research, write, and get published Bed Bug Treatment Handbook for consumers and the hospitality industry. Details: Coming from a research background, I was the sole data collector for this project. I also designed the layout and graphics. Proper bed bug management can be a very in-depth. Thus, each handbook ended up being 50 pages. One handbook was branded and targeted for the hospitality industry. The other handbook covered do-it-yourself consumer bed bug treatment. Custom elements were created for each brand. 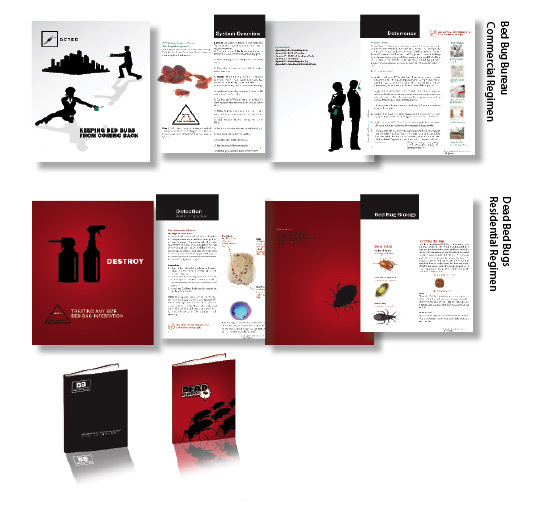 Also, icons were created to emphasize the overall theme of the 3-step treatment system: detect, destroy, and deter.